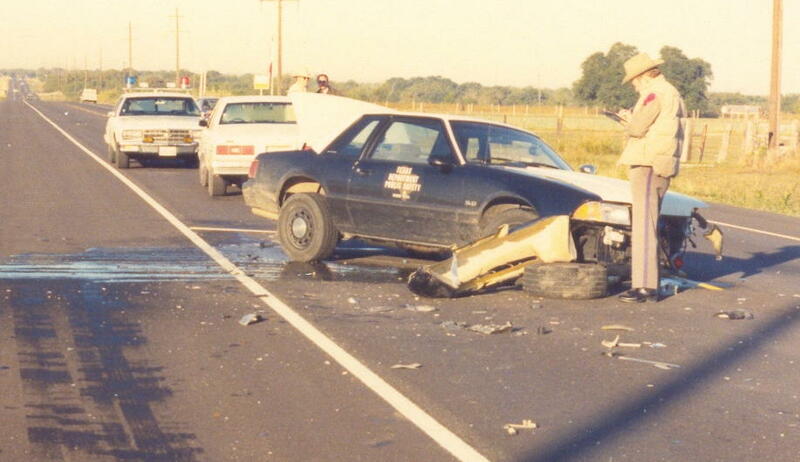 This part of our tour includes some pictures of wrecked Texas Highway Patrol Ford Mustangs. 1987 DPS Mustang - Wrecked! The top three pictures are of a 1987 Texas Highway Patrol Ford Mustang. This picture was made in 1988 or 1989. A Texas State Trooper was on routine patrol on U.S. Highway 90 in Guadalupe county near Seguin, Texas when obviously an accident occured. Trooper was not injured. Bad front end damage! Photo courtesy of Trooper Mike Cantu, THP-Seguin. 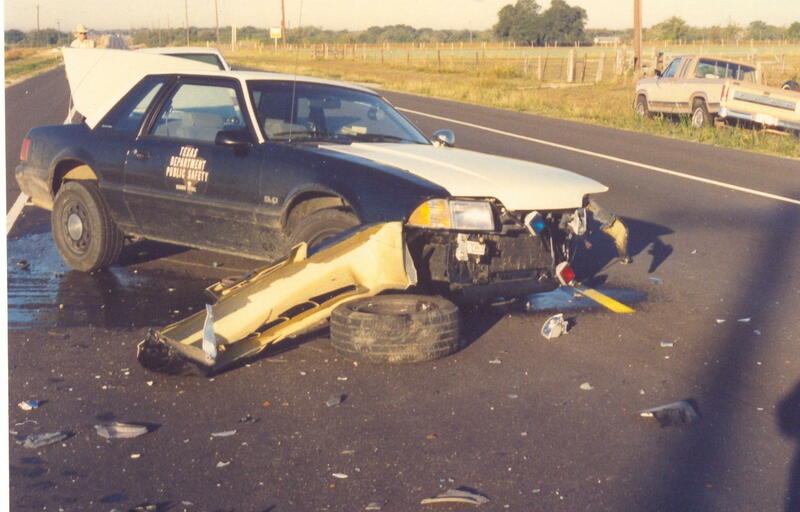 1993 DPS Mustang - Wrecked! On the night of March 23, 1996 Troopers Kevin Malone and Kervin Largent were on routine patrol on U.S. Highway 59 between Lufkin & Diboll in Angelina county. The troopers were turning around at a crossover and waiting for the traffic to clear when they were broadsided by an intoxicated motorist in a pickup truck. Both troopers escaped with only minor injuries. The intoxicated driver was taken to the Angelina county jail. This Mustang had black interior & a 5-spd manual transmission. It was driven by Trooper W.L. Kirkland prior to his transfer to Austin. This picture comes to us courtesy of Trooper Bryan Henry, THP-Lufkin (seen at far right in picture). 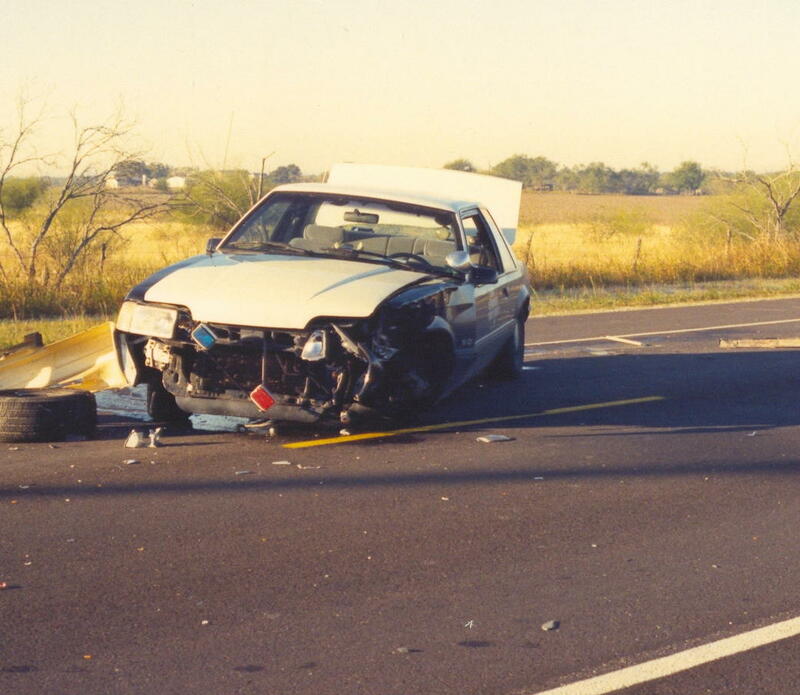 1987 Texas Highway Patrol Ford Mustang was hit from behind during a traffic accident. No further details. Photo courtesy of Trooper Kevin Malone, THP-Lufkin. Below: The bottom three pictures come to us courtesy of retired Sergeant D.L. Pruett. These pictures were made at the fleet operations center in Austin. These were 1983 model Texas DPS Mustangs. The one that is burned was struck in the rear one night while the trooper was conducting a violator contact. The Mustang immediately burst into flames. No injuries. The other Mustang has damage to the front and rear driver side.